Iraqi leader says U.S. withdrawal plan cannot be "open-ended"
BAGHDAD, Iraq (CNN) -- Iraqi Prime Minister Nuri al-Maliki said Monday there will be no agreement on a U.S. withdrawal from Iraq unless it includes a "specific" timeline and is not "open-ended." 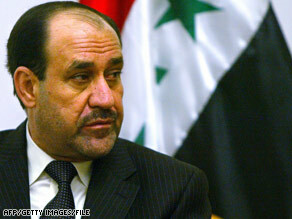 Iraqi Prime Minister Nuri al-Maliki says the U.S. plan for withdrawing must not be "open-ended." Speaking with tribal leaders, sheikhs and other prominent figures, al-Maliki said U.S. and Iraqi negotiators have agreed that there would be no foreign soldiers in Iraq after 2011 but that some "outstanding issues" remain, according to a statement released by his office. One issue the two sides have been working on involves the U.S. effort to keep U.S. troops in Iraq immune from Iraqi laws. The two sides have discussed a proposal that would lift immunity for private contractors, making them subject to Iraqi laws. Al-Maliki's statement Monday said he "will not allow the spilling of the blood of the sons of Iraq by granting open immunity." White House spokesman Tony Fratto, in a written statement, said discussions are continuing "as we have not yet finalized an agreement." "Our two countries are discussing goals for when Iraqi forces can meet the security needs of their own country, enabling U.S. forces to return home," Fratto said. He added: "We're optimistic that Iraq and the U.S. can reach a mutual agreement on flexible goals for U.S. troops to continue to return on success -- based on conditions on the ground -- and allow Iraqi forces to provide security for a sovereign Iraq." Meanwhile, a Multi-National Division-Baghdad soldier died Monday after being shot during a patrol in northern Baghdad. This brings the number of U.S. service member deaths in the Iraq war to 4,147. Violence in Iraq on Sunday took at least 30 lives, officials said. A suicide bomber struck during a party for a recently freed prisoner west of Baghdad on Sunday, killing 23 people and wounding 30 others, an Interior Ministry official said. The bombing took place in Hawaz, about 18 miles west of Baghdad, with women and children among the dead and wounded, the official said. The family of the prisoner -- just released from U.S. custody -- invited friends, relatives and security officials, including members of the local Awakening Council, over to celebrate, he said. The U.S.-backed Awakening movement, made up largely of former Sunni Arab insurgents recruited to fight Islamic jihadists loyal to al Qaeda in Iraq and other militias, has been a frequent target of suicide attackers in recent months. U.S. commanders credit the movement for much of the sharp reduction in violence over the past year, though jihadists have denounced its leaders as traitors and vowed revenge. Earlier, two roadside bombs exploded in a quick succession in central Baghdad, killing four people and wounding 14 others. One of the dead and two of the wounded were police officers, the Interior Ministry official said. The attack happened in Baghdad's al-Nahdha commercial district. People helping those wounded by the first bomb, which exploded about 10:15 a.m. near the al-Thilal Transportation Company and a police patrol, became victims themselves when the second bomb detonated at the same location, the official said. Most of the casualties were caused by the second blast, the official said. And three police officers were killed when gunmen opened fire on an outdoor market in the city of Baquba on Sunday morning, a city official said. Six people, two of them police officers, also were wounded in the attack, the official said. One of the three attackers was arrested, the official said. Baquba, the capital of Diyala province, is located about 40 miles north of Baghdad. Last month, Iraqi security forces backed by U.S. troops launched a large-scale military operation in the province to clear it from al Qaeda in Iraq and other insurgents.